Let’s just say a friend of a friend, who happens to be an Eco Goddess, is throwing a party and you’re invited. You want to impress her with your eco smarts and the best first impression is the gift you bring to show your appreciation. 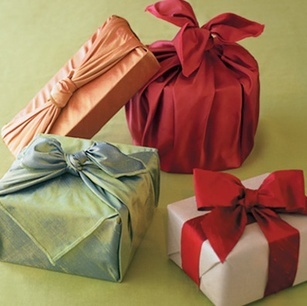 Here are some truly green gift ideas to suit all budgets. Bouquet of Organic Flowers. It’s an old standby, but you can mention that they were grown chemical free, so they’re safe to smell to your heart’s content. Aloe Vera Plant. A gift that truly keeps giving. Beautiful, exotic and medicinal. Who wouldn’t appreciate one of these? Bottle of Organic Wine. We’ve already compiled a list of our favorites. Organic Olive Oil and Aged Balsamic Vinegar. If you’re lucky, you’ll get to taste them with fresh bread at the party. Organic, Fair-Trade Artisan Chocolates. I love Theo Chocolate’s delectable confection boxes. Palm Wax Candles. This set of chakra candles is very cool gift for the hip hostess. Fair-Trade, Organic Tea Sampler. Arbor Teas and VivaTerra both have beautiful gift sets. Fair trade, Organic Soaps. Try this set in a hand woven basket from the Zambian Soap Company and support African families, or support local artisans and pick up something at the farmer’s market. Artisanal Sea Salt. Pinch, don’t pour. Organic Peppermint Bark. Have you tried this stuff? It’s amazing. Dark chocolate and peppermint, married in delicious delight. Organic Olive Lover’s Gift Set. Who doesn’t love olives? Angel Face Botanicals Lavender Lover’s Eco-Spa Deluxe Gift Set. I can personally vouch that Angel Face products are divine.